I only cringed slightly when I learned that the American Folk Art Museum was doing a show entitled Folk Couture: Fashion and Folk Art. Fortunately, the show was not the bad mix that first popped into my head. Fashion and folk art, both pretty broad classifications have a small overlap in the wearable category, depending on whose folk art we're discussing. I fantasize that each originator of a particular folk art technology might have been considered a fashion innovator in her day, hundreds or thousands of years ago. What was the reaction the first time someone in the village developed the first embroidery? What about the guy who made the first piece of woven fabric when everyone else was still wearing skins? Fashion icon? Probably not. Everyone was probably too busy just surviving. And in the year 2214, will today's high tech fashion, forged on a 3D printer be considered folk art? Well, it could happen. For this current exhibit at the museum, which opened January 21, 2014, thirteen "established and emerging" designers were given free rein to choose pieces from the American Folk Art Museum's collection to use as inspiration for a design. As a knit textile designer I'm always interested in how other designers find and use their inspirations. The thirteen designers showed a range from mildly influenced by their source material to close replication. Here are my favorites. This sheer LBD (little black dress) from Jean Yu says, "I'm approachable." But that sole epaulet says, "keep your distance." (My interpretation, not the designer's!) You can read more about Yu's process here. Her inspiration was the carved wood Porcupine by David Alvarez. 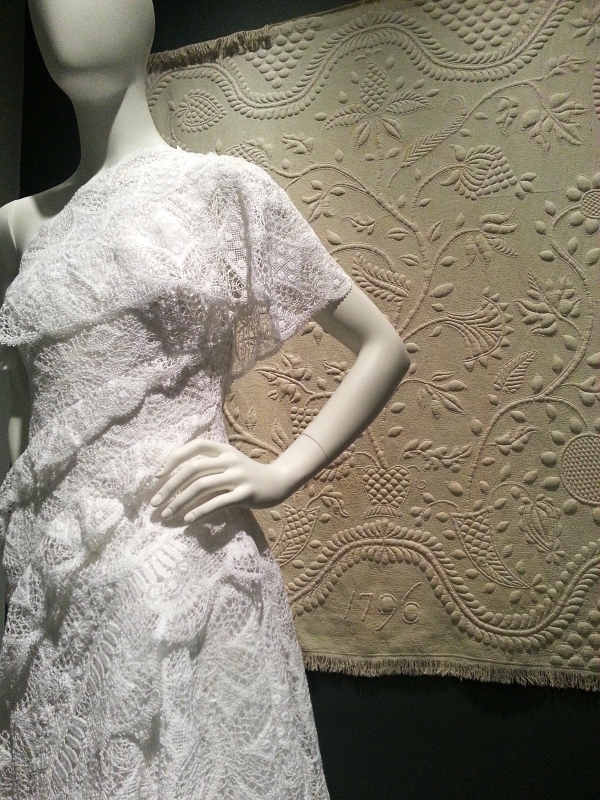 Looking closely (click to enlarge) at this lacy, handkerchief dress from Catherine Malandrino, you might think that some of the fabric motifs were based on the cotton quilt behind the mannequin. They were not. 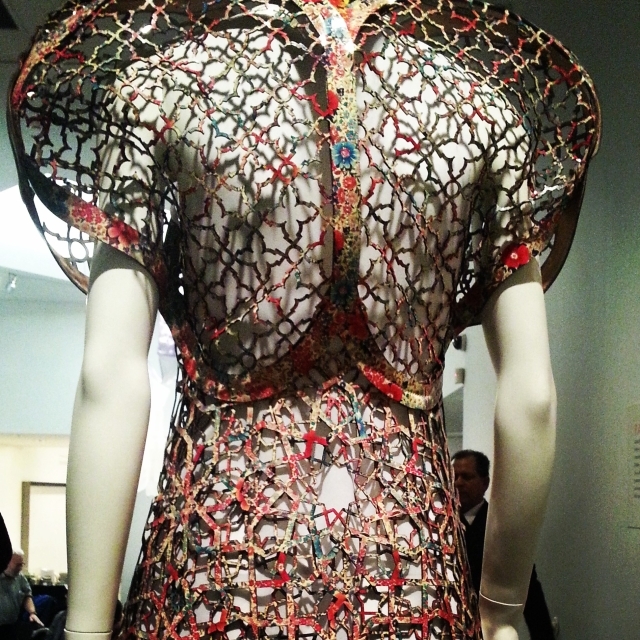 Malandrino's dress was inspired by a papercut of Odd Fellow symbology. The quilt was actually an influence for a design from Fabio Costa (NotEqual). I totally loved the effect from three laser-cut layers of patent leather for this dress by threeASFOUR. 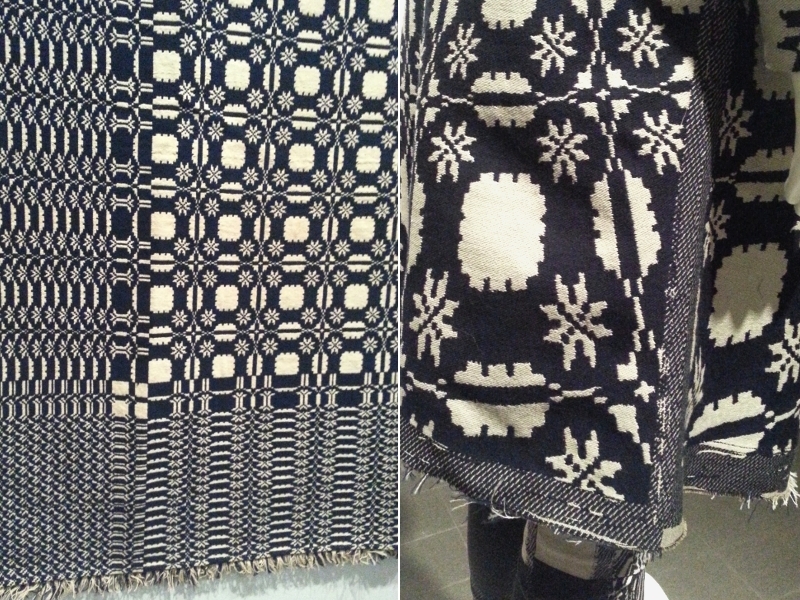 My favorite of the show used a stars-and-snowballs motif, found on a nineteenth century coverlet, as a starting point. 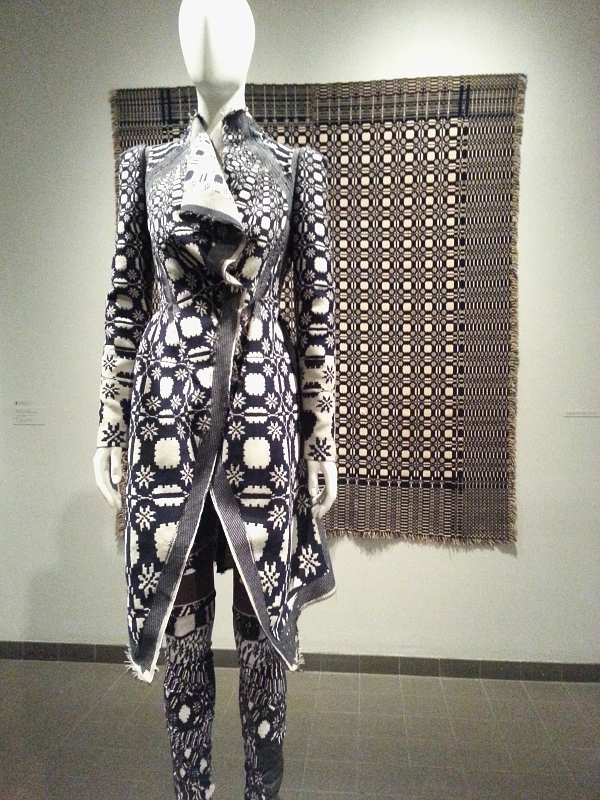 Gary Graham was able to have his take on the design programmed and woven on a modern jacquard loom at the Rhode Island School of Design. Graham's fabric "repeats" get smaller as they approach the top of the garment. I find it so very satisfying when textile and garment are designed or developed specifically for each other. See, hear, and read more on Graham's process here. The American Folk Art Museum is located at 2 Lincoln Square, Columbus Avenue and West 66th Street, New York, NY. 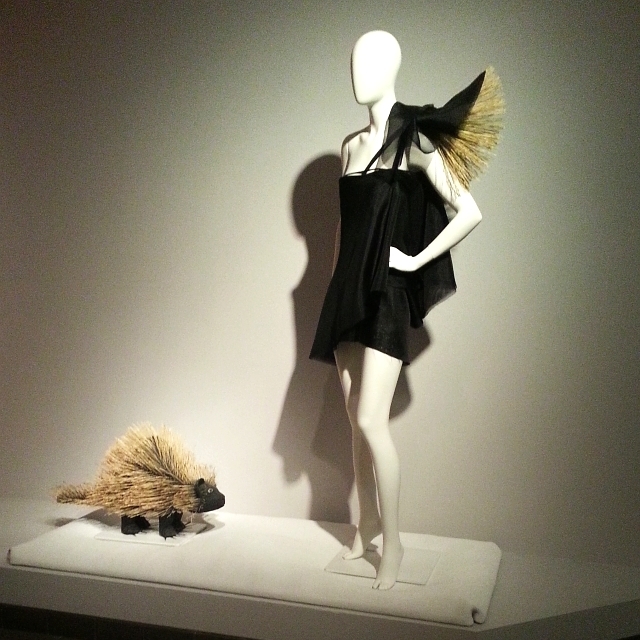 Folk Couture: Fashion and Folk Art runs through April 23, 2014. Thanks so much for sharing this exhibit! It's great to see stuff like this, especially since I don't live near enough to make a trip to the museum myself. So glad you enjoyed it, Andrea!